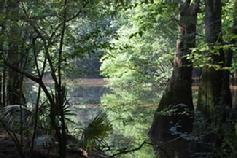 The Ocmulgee River makes up the entire southern boundary of Telfair County. Along this boundary, the river flows generally in a West to East direction. 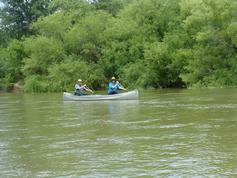 This gentle arc forms what is know as the "Big Bend" of the Ocmulgee River. 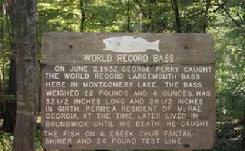 The Worlds Largemouth Bass (1932) was caught from Montgomery Lake, which is an oxbow lake on the Ocmulgee River in Telfair County, GA. This site is located on the Georgia Department of Natural Resources Horse Creek Wildlife Management Area. For fishing and boating regulations contact the Georgia Department of Natural Resources at (229) 426-5267. Directions from Lumber City, GA: Travel 2 miles North on GA Hwy 117. Turn left on County Road 185 (dirt road). Landing is .3 miles. Additional landing information and lodging information can be obtained from the Telfair County Chamber of Commerce. Let Your Passion for Telfair County Be Seen!